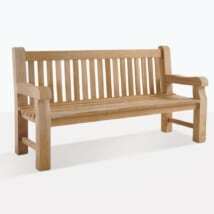 The biggest bench on offer at Teak Warehouse! 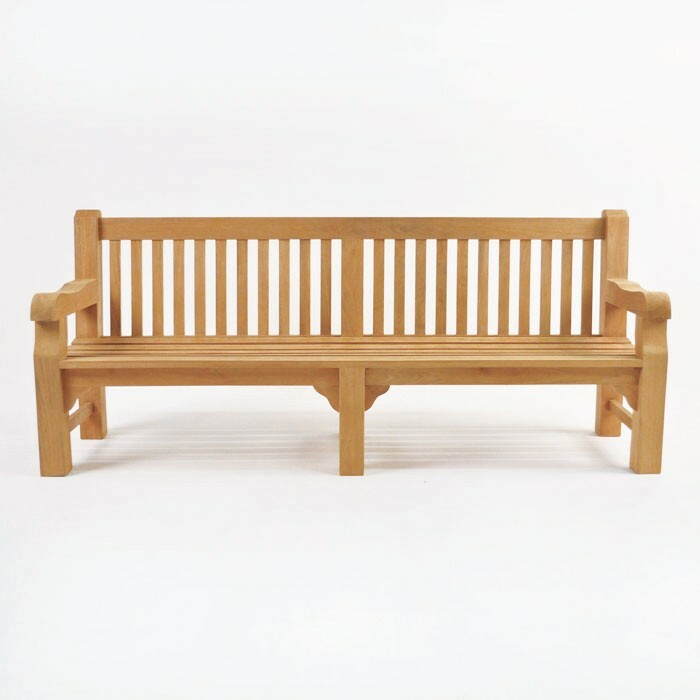 Our Classic Jumbo Teak Park Bench (4 Seat) is a superb and dramatic piece of furniture that has a simple style allowing it to inform many styles of spaces! A tremendous 94 inches long, the Classic Jumbo Teak Park Bench (4 Seat) features an ultra-chunky teak frame, with vertical slats running down the back of the piece, while long thick pieces run (horizontally) the length of the seat, making it comfortable and attractive! One thick center slat aids the grandeur of what is ultimately our largest bench yet! L94" x D28" x H40"
The Classic Jumbo Teak Park Bench (4 Seat) is constructed out of huge pieces of A-Grade Teak, known for its durability and gorgeous look. Actually considered the best natural material for furniture for outdoor use – A-Grade refers to the wood from the heart of the best teak trees. We only use teak trees that has reached the ripe age of at least 40 years – giving it the strength through the oil and rubber that has had time to develop within each tree. A-Grade Teak can be left to weather naturally, or oiled/sealed to maintain the honey color. Regardless of what you choose – maintenance is so easy! We recommend products like Simple Green, simply place a small cap-full in a bucket of warm water, and use a brush or sponge to follow the grain of the wood. A once over is all it needs a few times a year, to keep the dirt out of the tiny creases and your furniture looking stunning year after year! At Teak Warehouse, our range of A-Grade Teak crosses all our product lines! From beautiful benches to diving dining sets, delightful deep seating to perfect planters, resplendent relaxing chairs and even some of our umbrellas have a hint of teak! And we don’t just carry teak! If you wish to mix and match or have another look to enhance your outdoor space, then bring in Stainless Steel, Batyline® and Textilene® mesh or Raw Concrete to your setting. Teak Warehouse also has new, improved lines of All Weather Wicker, through-dyed to withstand the harsh UV rays. Place a couple of our fabulous Viro® Wicker Relaxing Chairs alongside the Classic Jumbo Teak Park Bench (4 Seat) for a modern edge to your traditional setting! 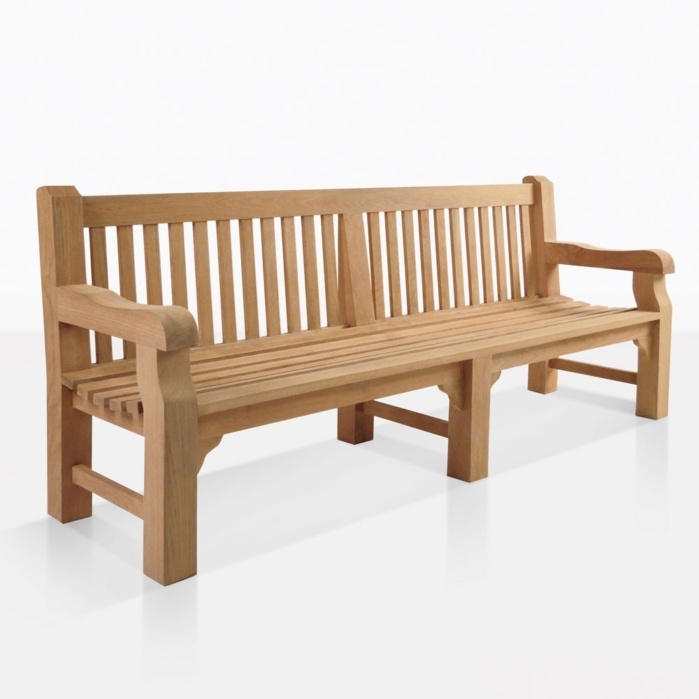 The Classic Jumbo Teak Park Bench (4 Seat) is part of our exciting Jumbo range of furniture which includes a (slightly!) smaller 3 Seater Bench and a gorgeous, spacious Arm Chair. Create a charming seating area with these pieces, or place them on their own for a statement piece! Have a large porch, perfect for iced teas after long summer days? Set the magnanimous 94” long Classic Jumbo Teak Park Bench (4 Seat) as your centerpiece framed by two of the Classic Jumbo Chairs and finish with a low lying coffee Table, such as an art deco style Coffee Table from one of our deep seating collections. Perhaps you have a lush garden that requires a space where you can lying down with your favorite book and enjoy your surroundings? Grab a plump cushion and lay out on this long, luxurious bench! 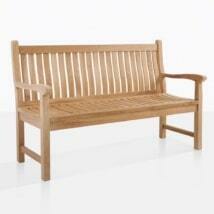 Massive pieces of A-Grade Teak come together in this classic family design heavy duty bench. Our Classic Jumbo Teak Park Bench (4 Seat) is a wonderful choice for the family home, a wonderful park or another commercial space! Call us today!